Ensure your wishes are met after your passing. Even if you’re currently in good health, you should be thinking about	how your family will get by should something happen to you. Having a professionally	prepared will in place is essential for ensuring that your wishes are	met after your passing. Most people would agree that making a will is	an extremely important part of planning your estate. Some people choose	to make a will as soon as they become employed, others until they have	children, and some wait until they retire. Regardless of when you decide	is the right time to make your will, it is beneficial to consult with	The Woodlands probate and estate planning attorneys at our law firm to	make the process as smooth as possible. Our legal team can also assist	you if you need to get a deceased loved ones’ wills properly validated	and executed in probate court. When you speak with our skilled lawyers	at The Law Offices of Andrew J. Bolton, Esq. you can rest assured we personalized	and professional solutions. Creating a will is one of the most important things you can do for your	family. 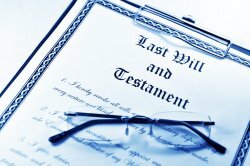 To reduce the likelihood of will disputes after your passing,	you should have a skilled professional help you with the following will	considerations. Choosing an Executor: Your executor will make sure the terms of your will are properly carried	out. If you choose to name an executor in your will, you should select	a responsible person that you can trust. Otherwise, the court will appoint	an executor. Updating Will Terms: As circumstances change, you may find it necessary to change the terms	of your will. An experienced will attorney will make sure that your will	reflects your present wishes. Avoiding Misunderstandings: If you fail to use the proper language in your will, it could lead to disputes	among your heirs. Having a will attorney help you draft a will with clear	language can make life much easier for your beneficiaries. With help from our attorneys at The Law Offices of Andrew J. Bolton, Esq.,	you can be sure that you will receive quality legal representation and	complete courtesy each time you speak with you. For more information about	creating or executing a will, contact us today at (936) 435-1908 or visit	our offices in The Woodlands and Huntsville. We also serve Conroe and Spring!